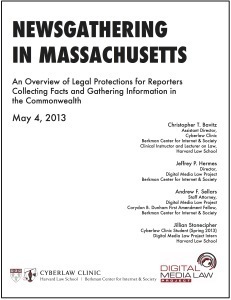 Home » New Legal Guide to Newsgathering in Mass. New Legal Guide to Newsgathering in Mass. A new guide to the legal protections available to reporters in Massachusetts was published this week by the Digital Media Law Project at Harvard University’s Berkman Center for Internet & Society and the Cyberlaw Clinic at Harvard Law School. The PDF guide, Newsgathering in Massachusetts, covers core topics related to news reporting in Massachusetts, including open meetings and public records laws, access to courts and courtrooms, recording courtroom proceedings, recording the activities of public officials in public spaces, and protection for anonymous sources. The guide, which is 24 pages long plus footnotes, was written by Cyberlaw Clinic and DMLP staff. In addition to describing the applicable law, it includes several case studies that illustrate how the law was applied to actual events. The guide is free to download and licensed under a Creative Commons Attribution-NonCommercial 3.0 Unported License.